I made this sea shell cake with 12, 10, & 8 inch pans. I made it from scratch. I used the better whipped icing on it. I made the see shells with the candy molds. I used a variety of sea shell molds to get different shapes. I dusted the inside of the mold with different colors of sparkle dust then added my white chocolate to the molds. I let it get firm then I took a paint brush and went over the finished sea shells with the sparkle dust again. It really got nice and shiny. For the topper of the cake. I printed a coral pattern off of the computer and took my candy bottle and traced over the pattern and let it set up. I put it in the freezer so it got hard enough to peel off the paper. Again I took my paint brush and took different colors over the finished coral. The sand around the cake is vanilla wafers that I chopped real fine and spread around the cake to look like sand. Everything on this cake is edible. It was a big hit at the reception. Live in Pa. and it went all the way to Delaware. Disassembled though. 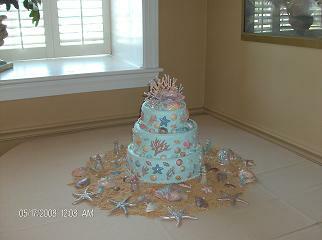 It was all decorated with the sea shells on it and none fell off. Hope this gave you some idea on how to make the sea shells. Very professional Kathy. You did a wonderful job and I especially like how you displayed all the shells. Not so crazy as I have seen others do. Keep up the wonderful work. P.S. The crushed vanilla wafers add a nice touch, different from graham crackers and brown sugar.